I’m always happy to offer Paris travel tips (check out a first-timer’s guide to Paris, a walking/photography tour, and my list of 10 small museums.) But I was truly intrigued when a blogfriend asked me recently about sightseeing in Roman Paris. Here are my top picks — and a quick history lesson to give them context. We don’t know exactly when the Parisii first settled the small islands in the middle of the Seine. 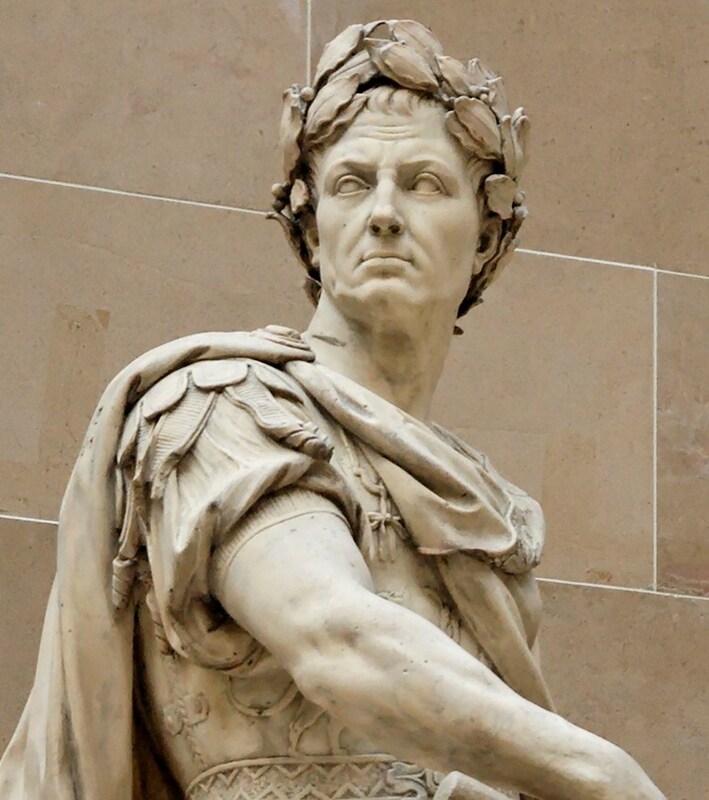 But by the time Julius Caesar set off to conquer Gaul in 58 B.C., some 8,000 people were living in what is now Paris. 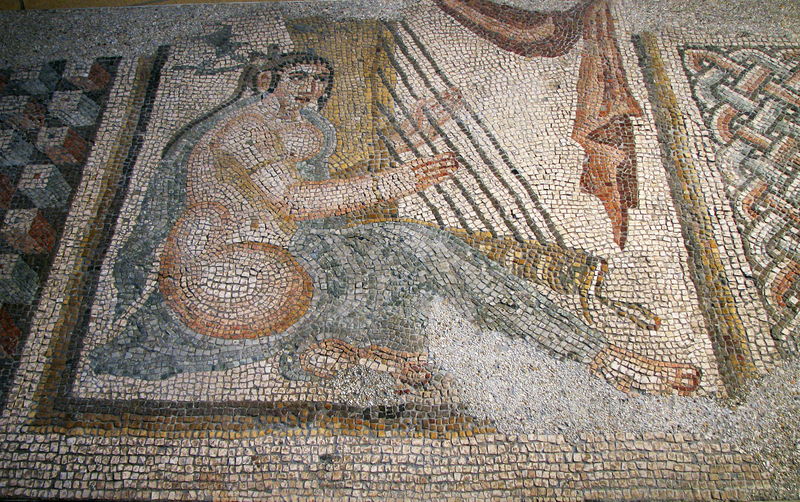 In 52 B.C. the settlement — which was led and defended by the Celtic warrior Vercingetorix — fell to the Roman military at Medun, and the Romans took control of Lutetia Parisiorum. A year later, in 53 B.C., Julius Caesar called a meeting of all the Celtic tribes in the new Roman city. The Romans began building roads and wooden bridges across the Seine, but almost immediately rebellion broke out. The Parisii burned their city (including the new bridges), fled into the surrounding countryside, and readied for war. But Vercingetorix and his ragtag army were no match for the Romans. Vercingetorix was captured and sent to Rome’s Mamertine Prison, and the rebellion was quashed. Lutetia Parisiorum was soon Romanized and reorganized on a gridiron plan. Construction expanded on the left bank, where the Romans quarried stone for buildings on a grand scale — including several temples and an amphitheater. They also built an aqueduct, which fed at least three baths. Lutetia was on the map. Lutetia Parisiorum became a minor trade nexxus, thanks to the navigable Seine river. But because of its relative physical and political isolation it remained a small city by Roman standards, with only some 10,000 to 12,000 inhabitants. As the Roman empire continued to spread and fracture, Lutetia once again became vulnerable. Two Germanic tribes — the Alemanni and the Franks — seized the opportunity and sacked the city. By about 300 A.D. the renamed Civitas Parisiorum was shrinking both in population and size, as the survivors scavenged rubble and retreated into a walled defensive stronghold. Civitas Parisiorum dwindled to little more than a military camp — a port on the river to supply the Roman fleet. 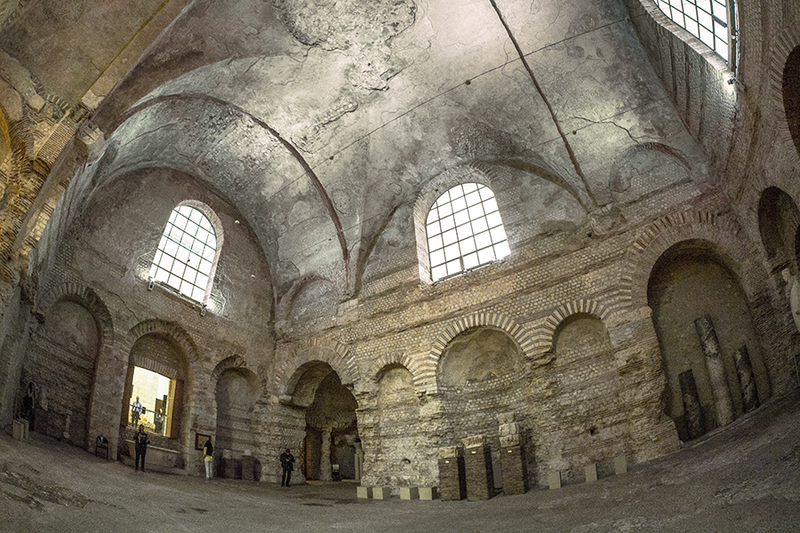 From 355 until 360 it was ruled by Julian, emperor Constantine’s nephew. In 360, while Julian was wintering in Lutetia, he was proclaimed emperor of Rome. Civitas Parisiorum was renamed “Paris” the same year. The Romans’ influence was waning, however. Although two other Roman emperors — Valentinian I and Gratian — would also live for a time in Paris, the barbaric invasions were taking their toll, and the Roman empire itself was collapsing. Paris and her people were soon abandoned to the invaders, and Paris’ Roman roots were eventually buried under centuries of history and rubble. Paris’ history after the Romans reads like a “who’s who” of invading hordes. 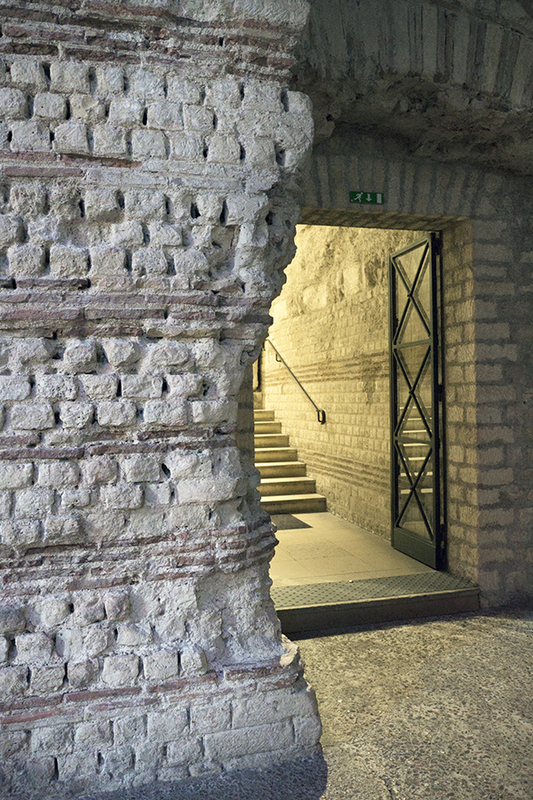 To defend themselves, the Parisians continued to pull stone from the Roman ruins to build fortified walls — which is why only a few Roman remnants remain. You can explore them all in this wonderful interactive tour, which reveals some secret and little-known sights. 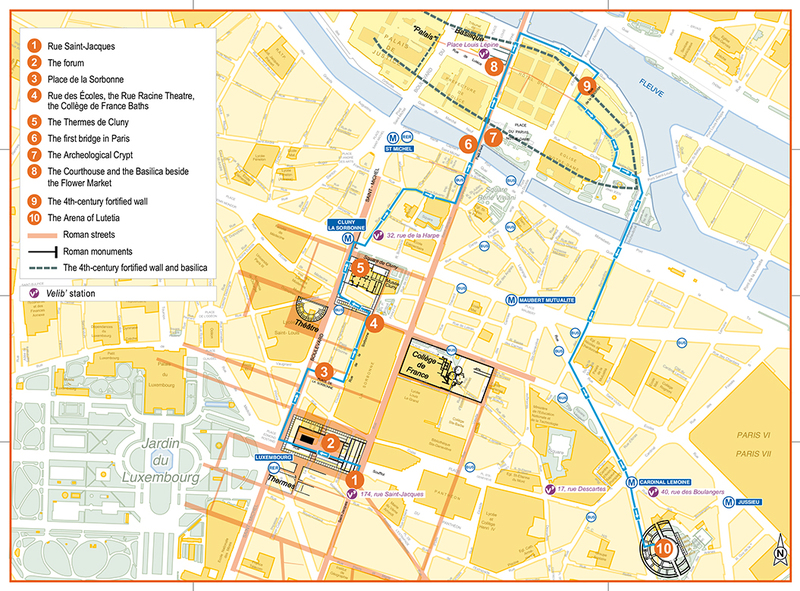 Or, you can print this PDF and take a self-guided stroll. OK, so technically the Louvre palace was built long after the Romans left. 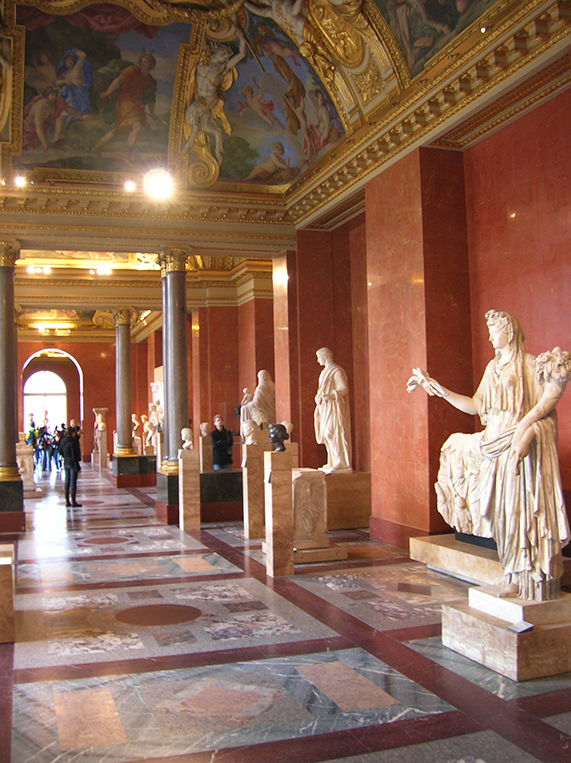 But the Louvre museum has an entire wing full of mosaics and sculptures and artifacts the Romans either left behind or that Napoleon stole. Buy yourself a museum pass*, skip the queue, and go look Julius Caesar in the eye. 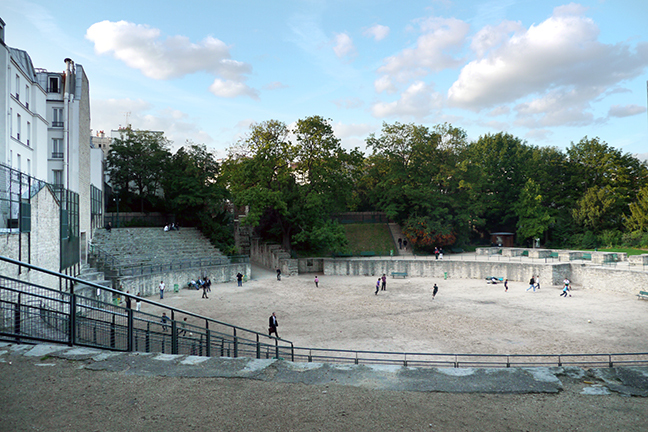 It’s easy to walk right past this 1st-century amphitheater because its entrance is hidden in plain sight at 49, rue Monge, 5th arrondissement. 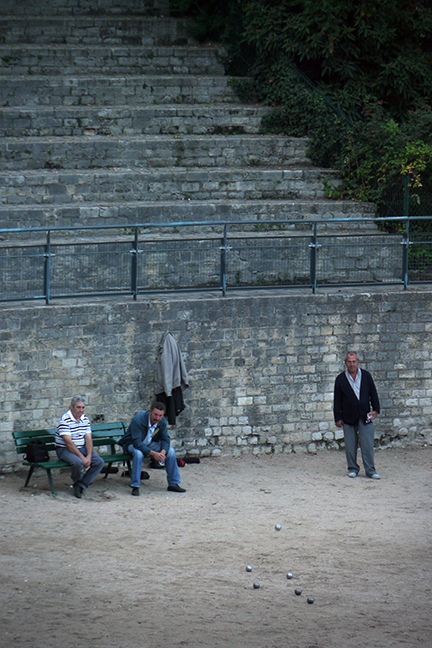 Not much is left of the stepped seating that could once accommodate up to 15,000 spectators, and the circular stage now hosts pétanque and soccer matches instead of gladiatorial games. But if you get there early in the morning (it opens at 8 or 9 most days) you may still be able to sit on the steps in silence and imagine the roar of the Roman crowds. More visiting info here. This is one of those museums whose setting is as exceptional as its collection. 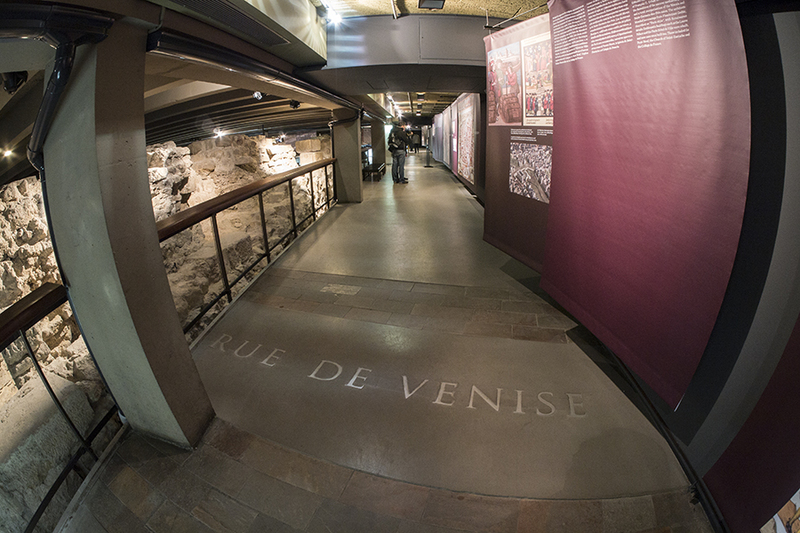 As the “Moyen Age” implies, the vast part of the Cluny’s exhibit is devoted to the Middle Ages. But you’ll also find a few earlier artifacts, including the famous Pillar of the Boatmen. Oh — and I almost forgot! The 15th-century medieval building was constructed around the ruins of a 1st-century Roman bath (with apologies for the crappy snapshots). Get hours and visiting info. 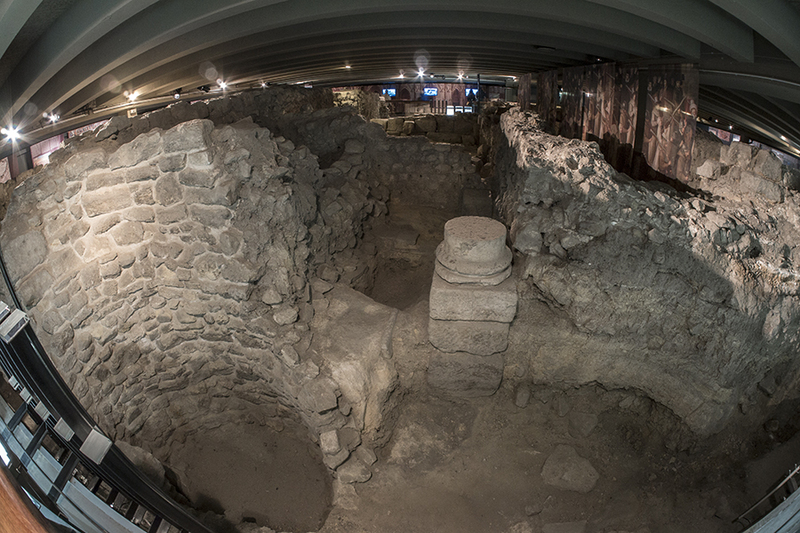 As with the Arènes de Lutèce, it’s easy to walk right past the greatest collection of Roman ruins in Paris … because they’re practically under Notre Dame cathedral. 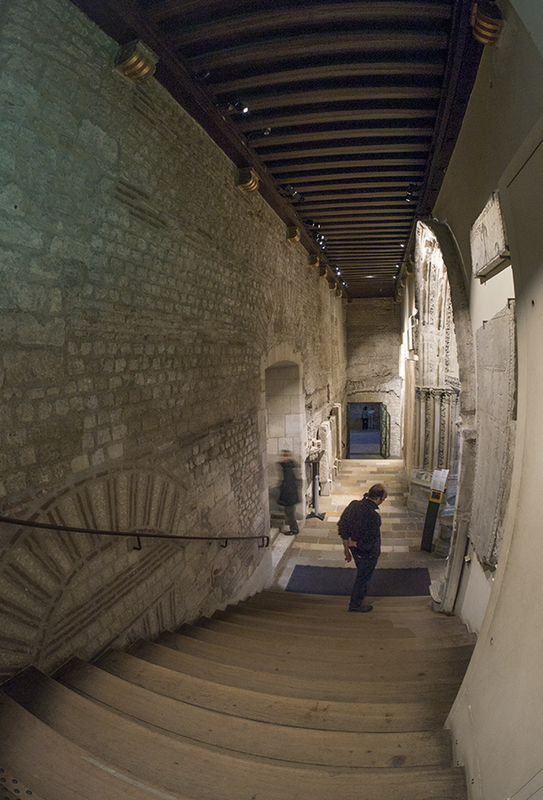 (Face away from the front doors of the cathedral, walk about 100 yards, and look for the stairs labeled “Crypte Archéologique.”) Here you will find Roman artifacts and carefully labeled architectural remains — including the island’s first quay, bits of houses, and sections of the ramparts. The museum has also recently added some beautiful and informative interactive exhibits. Get hours and visiting info. * I highly recommend buying a Paris Museum Pass. It will cover the entry fees for all the museums I’ve mentioned in this post — plus you’ll be able to skip waiting in line, even at the Louvre. You can buy the pass online, or at the ticket booth for any of the participating museums. Wow – thanks for that. I feel like stepping on the Eurostar and setting off to explore a Roman Paris I never knew existed. Over here in the UK, we populate the Paris of the past with Left Bank philosophers in black polo-necks or clutches of old ladies knitting next to guillotines. I’m adding togas to my historical imaginings. Thank you. Wow, do they ever sound terrifying! Hmm. I wonder if they ever thought of it – maybe they couldn’t think of a way to add an extra Monty Python layer of surreality to old ladies knitting while heads fell into baskets around them. The surreality is too ready-made for them. This is great! 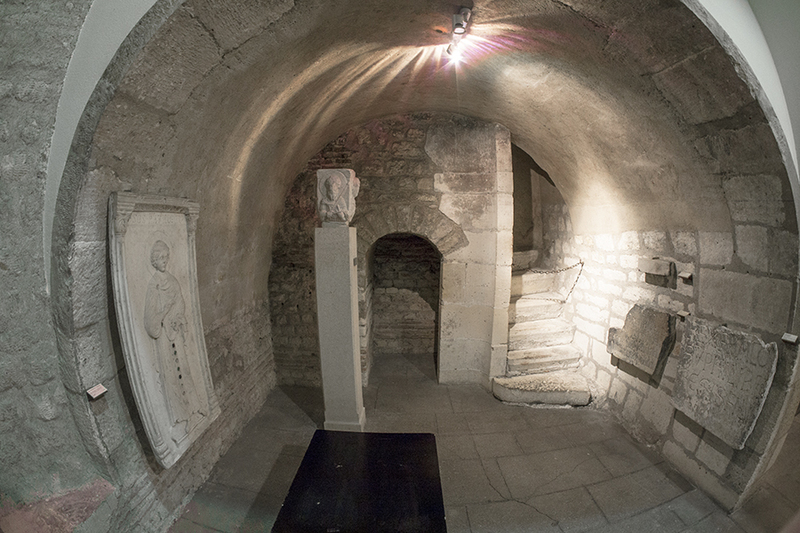 As you know the Arènes de Lutèce is high on my list of sites for my upcoming Paris sojourn, but I haven’t been to the Crypte Archéoogique yet and now I’ve added that. Thanks for the list! I’m so glad you found this, Paula — and especially glad it provided some useful info for your trip. I’ll be eager to follow in your adventures through your blog! I would love to explore in real life. Excellent reading. Thank you so much … I greatly appreciate your kind words. Reblogged this on Find it, Keep it. Thanks for this excellent overview of Roman Paris, and for your top ‘picks’. Two other reminders of the Roman’s occupation that you don’t need a ‘Museum Pass’ to see are rue Saint-Jacques and rue Mouffetard. Rue Saint-Jacques lies along the ‘cardo’ of Roman Lutetia, the main north – south street, which would have been lined with shops and street vendors back then much as it is today. Rue Mouffetard runs along the flank of Mont Sainte-Geneviève, known as ‘Mont Cetardus’ in Roman times, and it was the Roman road running from Lutetia directly south to Rome. In Roman times both these streets would have been at the heart of the economic activity of Lutetia – and they’re still here for us to walk along today. 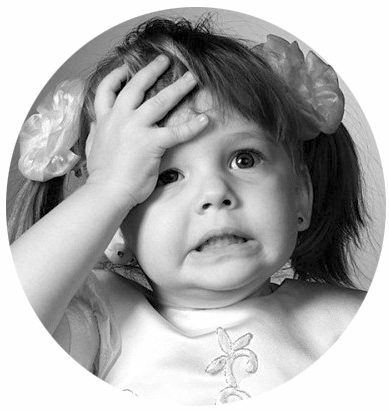 Thanks so much for your excellent additions, Des — or shall we say “addenda,” to keep it Latin? I’ll send my blog friend Paula a note and encourage her to visit these streets, too. (Because … talk about walking in the footsteps of history, eh?) Thank you, Des!